Jim works together with business leaders to help them address complex business issues and to resolve disputes, including complex litigation and class action cases. Jim has practiced law in both public and private sectors. He served as Vice President and Associate General Counsel for a Fortune 250 company, he served as a City Attorney in Virginia, and he has been a partner in law firms. He is admitted to practice before the United States Supreme Court, and he is licensed to practice in several jurisdictions. Jim is an experienced trial lawyer, with skills in all phases of civil trial and appellate practice. He has tried jury and non-jury cases to verdict, and he has argued appeals, in state and federal court. He has served as lead trial counsel in state and federal courts across the country, as well as in arbitrations and mediations. As in-house counsel, Jim successfully defended various forms of complex litigation, including class actions, securities claims, FINRA arbitrations, and a variety of individual life insurance and annuity cases. He managed litigation involving fraud, mergers, acquisitions, securities sales practices, producer recruiting and non-compete agreements, and selling-away cases. He led the efforts of a diverse, multi-state, multi-firm legal team that won a Federal Court decision defeating a complex nationwide class action lawsuit, avoiding hundreds of millions of dollars in potential liability and legal costs, and returned tens of millions of dollars to bottom line profits, changing the landscape for the legal analysis of class action cases. Jim counsels banks and other financial services companies in matters related to administrative, regulatory, and legal compliance, including data privacy/security, records management, and electronic discovery. With over twenty-five years experience in trial and in-house work, Jim’s background allows him to counsel his clients on complex legal issues, with an understanding of business needs and objectives and with a dedication to common-sense problem solving. Jim graduated from the United States Military Academy at West Point, where he was selected as the First Captain, Commander of the Corps of Cadets. He completed Airborne and Ranger Schools, and commanded several combat-ready Cavalry platoons. After five years on active duty, Jim received his law degree from the College of William & Mary, at Marshall-Wythe School of Law. Jim remains active in his community. He serves on the Board of Directors for West Point AOG. He is Founder and President of American Heroes for North Carolina, a non-profit community effort designed to transform the lives of veterans and to create benefits for our communities by integrating veterans and by recognizing the contributions of our veterans. 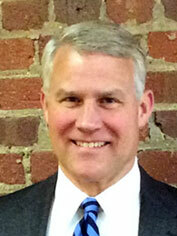 He serves on several Board for local organizations, including development companies and non-profit companies. Jim resides in Greensboro with his wife, Mary Ann, and their son, Josh.